Fighting off cancer requires the concerted efforts of immune molecules throughout the body, rather than just in the tumour itself, according to a new study of laboratory mice by researchers at the Stanford University School of Medicine. The finding helps settle an ongoing dispute among clinicians as to whether systemic, or whole-body responses, are as important as a robust response by immune cells in the tumour itself. The study may help clinicians understand why some people with cancer respond favourably to cancer immunotherapy, while others experience little or no benefit. It also suggests ways that the effectiveness of ongoing therapies could be quickly and easily monitored. Engleman is the senior author of the study, which will be published online Jan. 19 in Cell. The lead authors are Matthew Spitzer, PhD, a former Stanford graduate student who is now a postdoctoral scholar at the University of California-San Francisco; former Stanford postdoctoral scholar Yaron Carmi, PhD, who is now an assistant professor at Tel Aviv University; and Stanford postdoctoral scholar Nathan Reticker-Flynn, PhD. The researchers compared the immune responses of a special group of laboratory mice engineered to spontaneously develop triple-negative breast cancers. These cancers are resistant to a type of immunotherapy known as checkpoint blockade. Recently, however, Engleman and his colleagues showed that they could stimulate a successful immune response and eradicate tumours in the animals with a two-pronged approach that incorporated both a tumour-binding antibody and molecules that activated a type of immune cell called a dendritic cell. Spitzer, Carmi and their colleagues collaborated with co-author Garry Nolan, PhD, a professor of microbiology and immunology at Stanford who has developed a way to use a technique known as mass cytometry to monitor the physical attributes of individual cells in samples of millions or billions. This allows researchers to piece together a dynamic picture of how multiple cell populations respond in real time to changing conditions like disease or drug therapies. Spitzer and his colleagues used the technology to monitor the rise and fall of various populations of immune cells within the tumour as well as in other tissues – including the lymph nodes, spleen, bone marrow and peripheral blood – throughout the body immediately after immunotherapy and throughout tumour rejection. These cells also divided more rapidly. In contrast, the tumours of the animals receiving the ineffective therapy, checkpoint blockade, displayed no such increase in prevalence or proliferation. Importantly, the researchers also observed an increase in a class of T cells called regulatory T cells in the effectively treated animals during priming. The presence of these cells during tumour rejection was surprising because they have in the past been correlated with a negative prognosis for many tumours. “Our observation of an increase in the prevalence of these cells in successfully treated tumours runs counter to conventional wisdom and points out the complex nature of immune responses that lead to successful immunotherapy,” said Engleman. Tumour rejection in the effectively treated animals began by day eight. However, in contrast to the priming phase, the researchers observed no differences in the rate of immune cell proliferation in tumours between the two groups of animals during this time. In fact, immune cell proliferation in the tumour ceased altogether by the rejection phase. 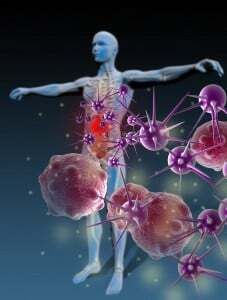 This finding suggests that, although the initial immune response occurred primarily in the tumour, immune responses in other parts of the body are likely responsible for sustaining the immune attack. Spitzer and his colleagues observed increases in the number and activity of immune cells in lymph nodes near the tumour during both the priming and rejection phases in the effectively treated animals. Surprisingly, the same types of immune cell increases were seen during the priming and rejection phases in the spleen as well as in lymph nodes that were located a great distance from the tumour. Moreover, the researchers were able to document similar stage-specific changes in the activity and prevalence of immune cells in the peripheral blood. In particular, a marked increase in a type of memory CD4 T cell was seen in the blood, as well as in peripheral lymphoid organs, during the rejection phase in mice that received effective therapy. This finding is important because the rise in these CD4 T cells may prove useful as an indicator of treatment efficacy in cancer patients who receive different forms of immunotherapy, thus allowing researchers and clinicians to develop a way to accurately monitor the effectiveness of ongoing immunotherapies with a simple, noninvasive blood test. This possibility was supported when the researchers analyzed immune cells in the blood of patients with melanoma who had received immunotherapy. The results showed that a similar subset of CD4 T cells was associated with a positive response. Beyond identifying a potential biomarker of effective therapy, the researchers showed that when the CD4 T cells in successfully treated mice were injected into the tumours of untreated animals, the cells stopped the tumours from growing. The importance of the systemic immune response was validated when the researchers gave the mice a compound that inhibited the ability of immune cells to migrate from secondary lymphoid organs, such as the lymph nodes and spleen, to the tumour site. This intervention allowed sustained tumour growth even in the face of a previously effective treatment.